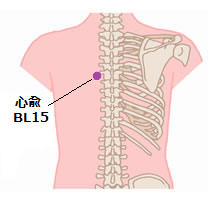 BL15 (心兪) is used for the Night sweats which is excessive sweating (hyperhidrosis) during sleep. BL15 : In the upper back region, find the fifth vertebra (T5), two fingers outside of T5 is BL15. Try to look for a point with strong sensation around BT15.